The 67 metre motor yacht Anna 1 has had a central agency change and is now jointly listed for sale by Yachtzoo with Burgess. With exterior styling and interior design by Michael Leach, Anna 1 was built in steel and aluminium by Dutch yard Feadship to Lloyd's class and MCA coded with delivery in 2007. The interior, featuring polished burr elm and flame mahogany woods, accommodates up to 17 guests in six cabins. These comprise a master suite with a private sea terrace, a VIP suite, two doubles and two twins plus Pullman berths. All guest cabins have entertainment centres, 42-inch Panasonic television screens and en-suite bathroom facilities. 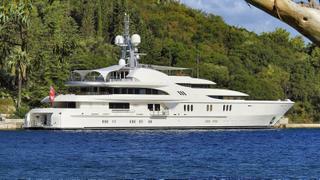 A further four cabins sleep up to 17 crewmembers aboard this yacht for sale. The main deck saloon has comfortable seating, a bar and an entertainment centre including a 50-inch Panasonic television screen and a Kaleidescape on-demand audio and video server. At night, this entire area can be transformed into a disco, with a DJ mixing deck and a smoke machine. The upper saloon also serves a dual role, serving as a relaxation area but also transforming into a home cinema in front of a 65-inch Samsung television screen. On her exterior decks, Anna1 offers several spaces for al fresco relaxation and dining, including a large sundeck with a Jacuzzi, drinks fridge and sun loungers. Twin 2,650hp Caterpillar diesel engines power her to a cruising speed of 13 knots and a range of 5,100 nautical miles. She is fitted with a Kongsberg dynamic positioning system enabling her to cruise to endangered sea areas without dropping anchor. Anna 1 is still asking €65,000,000.